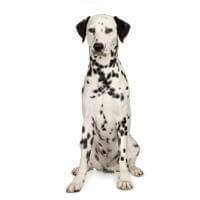 The picturesque spotting of the Dalmatian makes this breed among the most distinctive of dogs. Pups are born white and begin to acquire their black or liver spots at about two weeks old. Although a breed of ancient lineage, in Victorian times the Dalmatian gained a reputation as a carriage dog and ran with the horses, either out in front, beside or behind the carriages of the nobility. This is another fairly large dog where healthy females should weigh about 32kg and be 56cm in height and the males should be about 42kg and 61cm tall. Dalmatians are fun loving, natural clowns with both elegance and humour being hallmarks of the breed. Their ‘smile’ is often taken for a snarl, until one spots the madly wagging tail. The breed's fairly sensitive nature also craves human company and affection. Dalmatians are perfect as a companion, a watchdog, and a marvellous pet for the family, but as they are strong and active they do need to be kept under control.